WANNA POGO? Our "Perfume On the Go" is a girl's best friend! 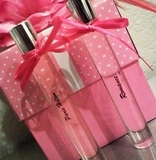 Great for traveling, freshening up after a long work day right into a night out.... Rollerball fragrance lingers longer! Comes in a 1/3 oz Designer Perfume Oil for WOMEN convenient Roll on Bottle. It won't irritate your allergies, now that's priceless... We have never compromised our quality and never will. You may find that other companies may offer lower prices, but they cannot match or provide the quality we offer. Environmentally friendly product. .33 oz (1/3 oz) Designer type Perfume Oil for WOMEN Roll on Bottle. Receive THREE bottles of your choice. Rollerball fragrance lingers longer! We have never compromised our quality and never will. You may find that other companies may offer lower prices, but they cannot match or provide the quality we offer. Environmentally friendly product. Our lotion has a luxurious feel and is made of Shea Butter, Chamomile Extract, Aloe Vera Extract. Leaving your skin soft and nourished.